Dance and move with the best little partner of all – your baby! 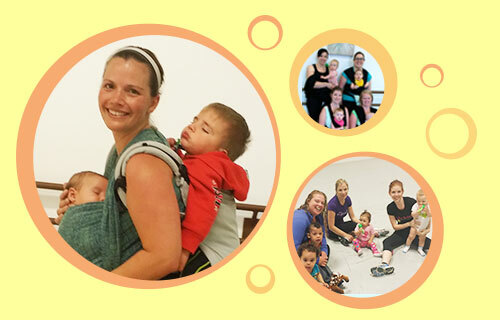 With little ones snuggled in to baby carriers, Salsa Babies™ offers a great workout, a chance to socialize and an opportunity to introduce one’s child to music and movement. Classes are appropriate for babies 6-8 weeks of age and up. A great workout that is fun! Salsa Babies™ offers a great workout, a chance to socialize with other parents, and an opportunity to introduce one’s child to music and movement. Not to mention, it’s perfect for people who have always wanted to learn to dance, but could never convince their partner to take lessons! A great workout that is safe for mom and baby! Salsa Babies™ works diligently to ensure the safety of our programs for all of our participants. Our program was developed by working hand in hand with one of the top Canadian pre/postnatal fitness certification providers. Our instructors are required to go through our lengthy and thorough Certification program. We have our program scrutinized yearly for safety and industry changes. Not sure if Salsa Babies™ is for you? Come and have a FREE trial a class before registering. We are sure you are going to love it! Babywearing? What do I need to know? While Babywearing has become a huge trend in the last number of years, wearing ones’ baby has always been a part of a busy moms life! What you need to remember is that your baby should be safely secured in the carrier of your choice. There should be minimal movement, while the entire core of the body is snug ( but not tight). Smaller babes should have neck support also. Your baby’s face should be visible and kissable! Your baby’s airways should be completely unblocked by the carrier or any accessories. To limit over-stimulation and to encourage proper support of the spine and hips, International reccomendations are that your baby face inward and their legs should be in an “M” position. To find out more information on how to use your own carrier properly, please visit our friends at Babywearing International (http://babywearinginternational.org). Or visit the website of the manufacturer of your specific carrier for guidance on proper use and supporting your baby. For safety of both mom and babe we require that baby is 6-8 weeks of age, and that mom has gone to her 6 week post-partum checkup and given the okay to proceed with fitness. Even at 6 weeks post-partum mom may still not feel physically ready, so we advise moms to also trust themselves as to their readiness. There is no upper age limit, and while most babies in the class are under 12 months, it is not uncommon to find older babies as well. The basic guideline is that both mom and baby should be comfortable using a baby carrier for the duration of a 45-minute class. It is an individual decision depending on various factors including fitness level, type of carrier, and size and weight of baby regardless of age. 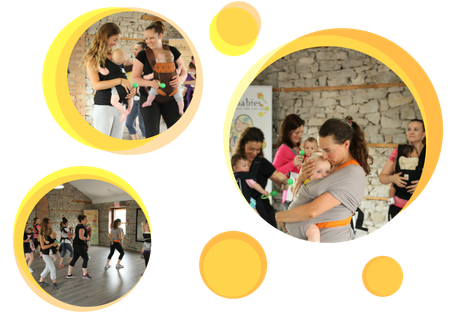 Salsa Babies offers a free trial class in case you are still uncertain whether the class is suitable for you and your baby. It is best to come to class prepared to move around. Comfy clothes, running shoes, or if you have them, dance sneakers work well. It is strongly recommended to bring a bottle of water for yourself in addition to any baby items you require. Because the baby is worn against your body, you can both get a little sweaty by the end of class, so you may wish to dress the baby in layers or bring a change of clothes. Of course you’ll need a baby carrier. There is a wide range carriers on the market, but we recommend one that is safe, supportive for both mom and baby and comfortable for you and your baby. Can I do Salsa Babies while carrying my baby in my arms? We are huge proponents of safety for both mom and baby. You don’t need to wear your baby for everything you enjoy doing, because the fact is, some of those activities just aren’t safe to do while babywearing. In many cases, it is also unsafe to exercise with your baby in your arms. Though you will find many programs on that market that say it is safe to work out with babe in arms ( or laying down beside you) in most cases that just isn’t the case. Wearing your baby in our programs is a must – you will enjoy the experience far more when you can concentrate fully on snuggling and the fun! Is this class safe for me and my baby? In face we believe SO heavily in the safety component of our program that we have purchased the Pre/Postnatal Fitness Instructor Certification program Family Passages ( now called Fitness Alliance). The creator of the Family Passages Pre/Post program is an award winning International speaker, and leader in the Pre/Post Fitness field, and highly regarded as a leader in our industry. We also partner directly with The Canadian Babywearing School for the most up to date and relevant babywearing practices and information. Salsa Babies has a very in-depth and precise post-natal manual which our instructors are required to learn and be tested upon. Our program and material is also scrutinized each year to ensure its continued safety and adherence to industry standards. I have two left feet! Can I still do the class? Yes! Most people who take the class have never danced Salsa before, and many have no dance experience at all. We break the steps down so that anyone can join, and we review the basics each class. The most important thing to keep in mind is that it’s not about perfection, but getting moving, enjoying the music and having fun with your baby! Salsa Babies classes are designed to accommodate all levels of fitness. We know that some new moms are in excellent shape, whereas others who have had C-sections or more difficult pregnancies may need to ease back into physical activity at their own pace. We teach a basic program and offer adaptations for those looking to increase the intensity. How does it work with twins? For the price of one, parents of twins are welcome to bring a spouse, relative or friend to dance with the second baby. If this is not an option, some mothers of twins take turns dancing with one baby while the other either sleeps or looks on in their stroller or baby seat beside the mother. What if my baby is fussy, sleepy, hungry? Will it disrupt the class? No problem! Salsa Babies offers a totally baby-friendly environment, so fussing, crying, and spitting up, among other things, are all to be expected. 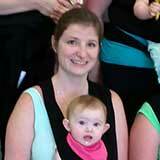 Most of our instructors are moms themselves and many even teach with their own babies, so they’ve been in your shoes. Babies may get hungry during class so Salsa Babies strives to provide a comfortable and relaxed environment to tend to their needs. Babies needs come first, so please feel free to take a break and pull up a chair if your baby needs to eat before, during or after class. Instructors will direct you to a diaper changing area for your particular class. If your baby is asleep when you arrive, you can join in the class while baby sleeps in his or her seat off to the side, and then pick up baby when he or she awakens. Rest assured that excessive fussiness is rarely a problem. The rhythm and movement of the class combined with being held close to their mom, keeps most babies content and often times asleep throughout the class. Salsa Babies understands that it is not always possible to get out the door on time with a new baby, and we’ve all had those rough nights and last-minute trips to the doctor. Therefore, we offer one (1) make-up class per session to accommodate for missed classes. This class can be used during the subsequent session or at another location. We aim to be flexible, so please speak with your instructor if you have any questions.